March 21, 2017 – (PORTLAND, Maine) – The fifth annual BikeMaine ride has sold out and is no longer accepting registrations from prospective riders, although people interested in volunteering in some capacity are still welcome to sign on, the event’s organizers announced today. 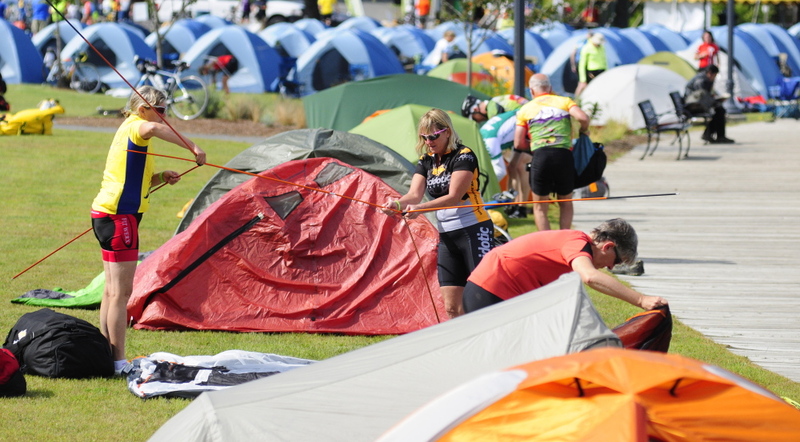 BikeMaine is a fully-supported, seven-day cycling tour organized by the Bicycle Coalition of Maine, with Anthem Blue Cross and Blue Shield as the presenting sponsor. The Coalition is the statewide voice of cyclists and pedestrians. Formed in 1992, the Coalition continues to lead the effort to make Maine better for bicycling and walking by protecting the rights and safety of cyclists and pedestrians through education, advocacy, legislation and encouragement. This year’s ride, dubbed, “Pathway to the Peaks,” will be held from September 9-16 and make stops in Skowhegan, Pittsfield, Kingfield, Rangeley, Hartford and Farmington. Participation is limited to 400 riders. Approximately two-thirds of BikeMaine riders are from out of state, with 20 percent reporting they have never been to Maine. Schmesser said that even though registration for BikeMaine riders is full, people can still participate as a volunteer. Prospective volunteers can sign up online at the BikeMaine website: ride.bikemaine.org. Since 2013, BikeMaine has pumped nearly $1.7 million into the local economies of the regions where past events were located. Last year’s sold-out ride in Downeast Maine contributed $626,000 in direct economic impact, including $400,000 spent by riders during the ride, and $226,000 spent by the Coalition to produce the event, which includes most meals for the participants. Whenever possible, food is purchased from Maine farms, fishermen and lobstermen, highlighting Maine products and local services, Schmesser said. The BikeMaine daily schedule is developed to allow riders to enjoy a carefully curated ride each morning, while leaving time to explore the hospitable and welcoming host communities each afternoon. Many local businesses, lodging establishments, bars, restaurants and gift shops in the past have reported record sales around BikeMaine’s visit to their communities. MACHIAS, Maine — Bicycling means business. That was the theme of a meeting held June 15 to plan for the development, promotion and management of long-term bicycle tourism opportunities in the Bold Coast region. Hosted by the Washington County Council of Governments, the Bicycle Coalition of Maine and DownEast & Acadia Regional Tourism, the meeting included 17 participants representing Washington County communities and organizations. The group plans to build on the fact that BikeMaine 2016 will bring 400 riders and 75 support personnel to the Bold Coast Sept. 10-17. The event will allow businesses and community organizations in the area to identify ways to serve bicycle tourists in the future. BikeMaine was started in 2013 by the Bicycle Coalition of Maine, a nonprofit founded in 1992 to make Maine a better place for bicycling and walking. Each year, the event organizers choose a course somewhere in Maine for the one-week tour, traditionally starting the Saturday after Labor Day. AUGUSTA, Maine – It’s National Bike Month, an opportunity for Mainers to support a fun and environmentally friendly way to get around. Brian Allenby, communications director with the Bicycle Coalition of Maine, says there are plenty of reasons for Mainers to dust off their bikes and get back on the road for this national evemt that promotes the health and environmental benefits of riding a bike. Beers and Gears night at the Portland Museum of Art. It will take a detour from the usual and offer free valet parking for those arriving by bike. There also will be a bike rodeo this weekend sponsored by the Bangor Police Department. For those not rushing to cross the finish line, there also is a Slow Ride planned by Lunar Cycling Bangor on May 14. Portland, ME, February 4, 2016 – On Thursday night, the Bicycle Coalition of Maine revealed the route and host communities of the fourth annual BikeMaine tour. The week-long ride will cover 350 miles along the “Bold Coast” of Maine, exploring Washington and Hancock Counties. The event will take place from September 10-17, 2016 and allows riders to explore the people, places, culture, and food of Maine. In the past three years, BikeMaine has delivered over $1 million in direct economic impact to different regions of the state through rider spending as well as the sourcing of local products and services for the ride.